The sound of this synthesizer of Roland Boutique series is emulated applying the ACB technology - Analog Circuit Behavior, i.e. 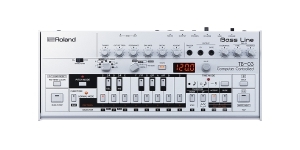 it differs significantly from the original device (TB-303), in contrast to the modern copies of old Roland drum machines presented on the market. However, the introduction of new technologies appeared to be beneficial: 4-channel audio output via USB appeared (in addition to the classic analog mini-jack, through which the compressed audio is transmitted), and, thanks to the compatibility of all Boutique devices, connection to K-25 keyboard was also available. Of course, there are MIDI inputs and outputs and MIDI via USB support. TR-03, Bass Line is a bass synthesizer with the ability to fine-tune an instrument, the sound of which is generated by a sawtooth or square wave using resonance, cutoff frequency, envelope modulation, delay and decay effects. There is also an overdrive function. You can send a signal to external devices (CV/Gate Out) and receive a control signal (Trigger IN) which makes it possible to use TR-09 and TB-03 together, as well as to integrate other synthesizers with it. 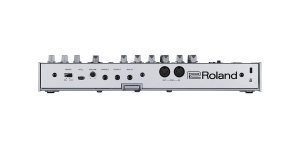 Roland Boutique series includes compact musical instruments which were created in honor of their renowned predecessors – Roland synthesizers of the past. The series comprises 3 modular synthesizers and a “basis” for a keyboard. MIDI controller with A-01 generator has appeared recently. It’s no surprise that the never-ending demand in their cult drum machines and the fact that vintage is back in fashion whipped Roland up to release 2 new modules – TR-09 and TB-03. 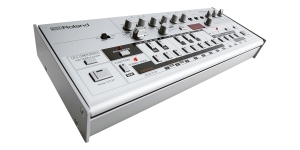 VP-03 vocoder was also presented – it was created based on the VP-330 which used to be popular 30 years ago. The legends are back. 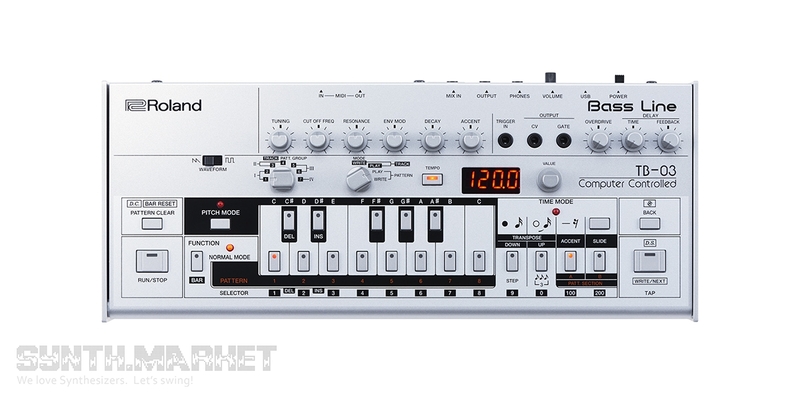 The cult TR-909 turned into Roland Boutique TR-09 and the most popular bass synth of all times – TB-303 – is now called TB-03. Both instruments follow each feature of their famous predecessors copying not only circuitry logic but looks and interface as well. You’ll definitely recognize those knobs and buttons on the front panel and will be happy to use the same functions.